Lagavulin's 200th anniversary was celebrated in 2016. Referencing a quote from Alfred Barnard, who visited the distillery in 1886 and remarked that he had tasted a particularly fine 8 year old whisky, they decided to try to create an homage to that style. Since that first release the 8 Year has been added to the regular lineup, alongside the standard 16 Year and Distiller's Edition plus the semi-regular 12 Year annual release. This whisky was aged in what I'm guessing were all refill ex-bourbon hogsheads, then bottled at 48% possibly with added color. Thanks to Florin for this bottle split. 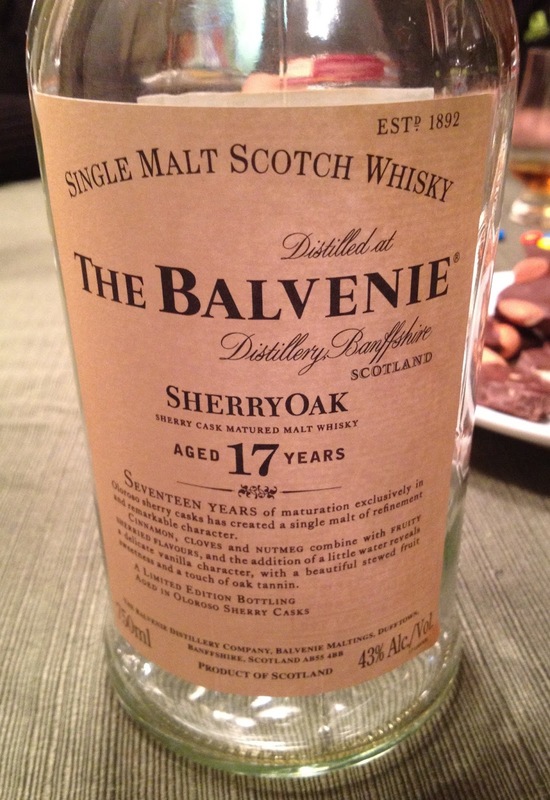 Nose: lots of raw, unburnt peat, fresh green malt, a rounder grainy note, hints of oak in the background, plastic. After adding a few drops of water the malt and peat integrate, but the profile remains similar overall. Taste: strong malt sweetness with some heat up front, peat starts in the background around the middle and shifts into the foreground near the back, vague fruity overtones throughout. After dilution the flavors get a bit brighter and the peat notes are stronger, but the overall structure remains the same. Whether or not this is your jam, I think they accomplished their goal of creating an "older" style of whisky. For all that we complain about how raw the whiskies coming out of new distilleries are, that's what most people would have been drinking before the 20th century. In a sense, it's an unfair advantage for the older distilleries that were established when no one expected their spirit to be aged for at least a decade. At the same time, this isn't the same raw distillate that would have been coming off Lagavulin's stills when it was established. Their processes are built towards their core 16 Year release and I suspect that an 8 year old whisky back then would have potentially offered something more interesting than this. 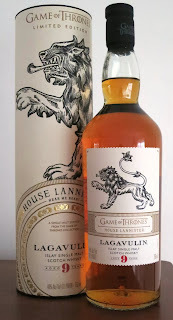 My expectations may have been too high after trying younger bourbon cask Lagavulin at the distillery, but this was an absolute let down. At least I didn't have to slog through more than half a bottle? Loch Gorm is the third member of Kilchoman's standard lineup. It was brought in to rotation in 2013, replacing the more generically named Sherry Cask Release. As that suggests, this is the version aged entirely in ex-sherry casks, both butts and hogsheads. 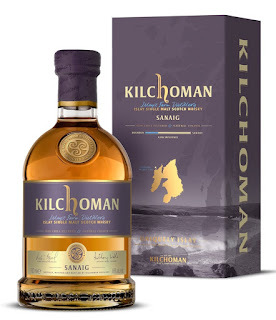 As with all Kilchoman's standard releases, this is bottled at 46% without coloring or chill filtration. The whisky was distilled in 2010 and bottled in 2015. Nose: rich but not overwhelming sherry, clean malt, gingerbread, dry mossy peat smoke, fresh ground coffee, vanilla, American oak, seashells/minerals, a little salinity. After adding a few drops of water it loses most of its intensity, leaving mostly soft sherry and peat, though some of it reemerges alongside savory and lemon notes with time. Taste: fairly sweet up front with some heat that carries through, fades through oxidized bittersweet sherry into light American oak and peat at the back. After dilution it gains some intensity but with less heat - the sherry expands towards the front and becomes brighter, the peat at the back is stronger and lingers longer. This is a bit more like it. Despite being aged exclusively in sherry casks, I find that element better integrated here than in Sanaig. Importantly the peat smoke is also more present, which helps to give the whisky a better balance. With that said, the aromas are clearly the star of the show at full strength. They have great intensity and a respectable amount of complexity. The flavors and finish are more than a bit of a letdown in comparison. I couldn't find much complexity and the finish just gave up. I was also surprised by the heat, despite the not especially high bottling proof. That may be down to the young-ish spirit going into this compared to Machir Bay, but without any definite explanation of how they're composed, that's just conjecture. Water largely flips that relationship, though it doesn't bring much more complexity to the flavors. 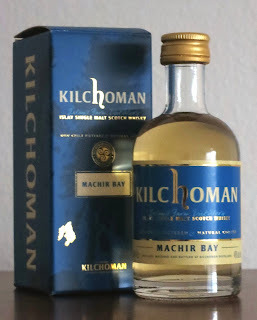 Overall this reinforce my sense that Machir Bay is the only Kilchoman that can be described as a good value. Others might be better, but given how much more you'll pay for them I can't in good faith recommend spending your money when there's so much quality to be had from their entry-level whisky. Hopefully someday they'll be able to have range where everything justifies its price point, but we're not there right now. I wouldn't say no if someone gave me a bottle... but I won't be spending my own money on it. While Kilchoman's Machir Bay has been holding down their standard lineup for some years now, it has gained some company more recently. Sanaig is roughly the mirror image of Machir Bay - while the latter is built from a 80/20 bourbon:sherry mix, Sanaig is built from a 30/70 bourbon: sherry mix. This lets the sherry shine without completely leaving out the bourbon cask component. As with all of Kilchoman's entry level malts, this is made from Port Ellen malt and bottled at 46% without coloring or chill filtration. I purchased this sample from Dramtime. Nose: somewhat closed initially - light dry peat smoke, smoked fish, oxidized sherry, Hawaiian Punch, muddled malt and floral notes, baking spices. After adding a few drops of water the sherry becomes brighter and a little nutty, some more oak comes out, and the peat becomes stronger. Meh. I can see what they were trying to accomplish here, but it feels like too much has been taken away from the spirit without the casks adding much in the way of extra complexity for me to get excited about it. If anything it the mix of floral notes, sherry, and light peat reads like an appeal to Bowmore fans. The nose is the best part and is engaging if soft, but the flavors are just too flat without any of the fire I expect from Kilchoman. If they were primarily using refill rather than first fill sherry casks I can imagine this working, both in terms of the sherry having a lighter touch and potentially less oak impact. I'll happily drink Machir Bay instead, which is cheaper to boot. Kilchoman remains Islay's youngest active distillery, despite the numerous proposed new distilleries being built on the island. While they began their releases with a series of seasonal releases that charted the development of their spirit, that changed when Machir Bay became their first regular release. It was initially composed entirely from ex-bourbon cask whisky that was five years old or less, with a small proportion finished in ex-sherry casks. More recently they have stopped stating the age of the components and the exact treatments they get, but it is made from 80% ex-bourbon casks and 20% ex-sherry casks. While they have whisky that is over ten years old now, it is likely that what goes into this release remains largely or entirely younger than that. As with all of Kilchoman's entry level malts, this is of indeterminate age and was bottled at 46% without coloring or chill filtration. Nose: dry peat smoke, cigarette ash, incense, young/fresh malt, brown sugar, a touch of sherry, floral heather and violets, light American oak, seashore in the background. After adding a few drops of water it becomes softer with less ashy peat, the sherry largely retreats, and the floral notes mostly disappear. Taste: mildly sweet malt with a touch of sherry up front, becomes bittersweet with oak tannins and rising peat smoke in the middle, some alcohol heat at the back. After dilution the peat gets stronger and moves forward on the palate, the sherry sweetness is stronger and extends further back, some seashore notes comes out around the middle, and the oak tannins mostly disappear going into the finish. Hey, that's pretty good. There was less cured meat on the nose and the peat was better integrated on the palate in this version compared to the first edition I tried, but otherwise it felt pretty consistent. I suspect that some of this is that Kilchoman now has older stock to blend into this release, so it comes off as less fiery than the version that was composed from 95% whiskies that were four years old or less. 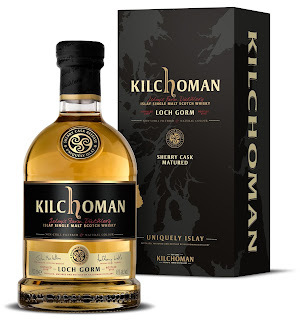 Overall, I think this remains the standard by which all other Kilchoman releases are measured, much like Ardbeg's 10 Year is for that distillery. And as with them, the question Machir Bay always raises is whether the more expensive releases are enough better to justify their price tags. So, after all of those Balvenies, where do we stand? Honestly, almost exactly where I was before. 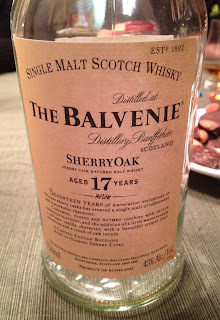 While I often find that whiskies I tried near the beginning of my experiences hit me quite differently now, Balvenie has remained pretty much where it was when I started. They make good whisky, but not for me. And definitely not for my wallet. All in all, I can't say that I blame them. I find the results disappointing in much the same way that I find Bowmore disappointing - there's no question that the distillery produces top-notch spirit, but because of their customer base is just fine with the status quo, most of what we get is watered down. I mean, even the higher strength releases are still proofed down well below 50%, so we're not getting to see what their spirit can be like with some real heft. In my ideal world we'd get something like their sister distillery Glenfiddich's 15 Year Distillery Edition - a blend of bourbon and sherry casks at higher proof and a respectable price. I'm perfectly happy being tossed a bone, even if the rest of the lineup isn't for me. But with most of Balvenie's similarly aged and lower proof releases coming out over $100, I'm not about to hold my breath. Ultimately, I will just have to keep looking elsewhere for my gentle Speyside fix. Thankfully there are any number of other distilleries in the region that can tickle that fancy without costing me an arm and a leg. 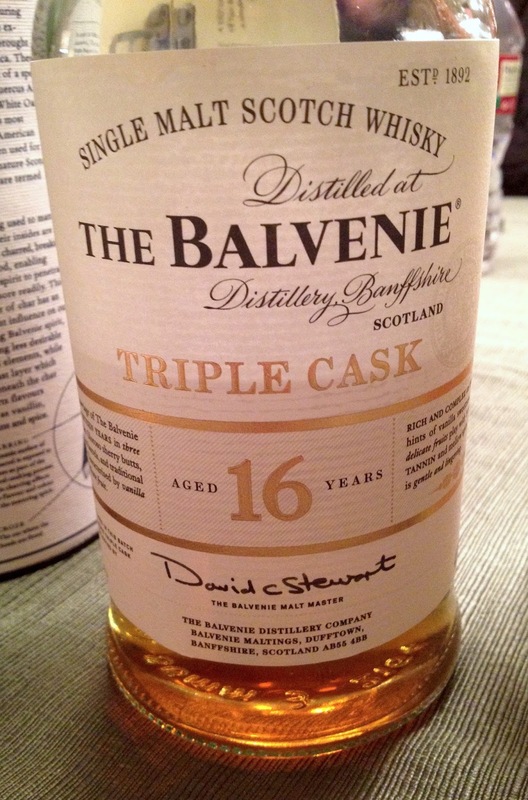 Balvenie 17 Year Doublewood was introduced in 2012 as the distillery was radically shifting its lineup. For the first decade of the 2000s the 17 year old malts had primarily been a way to show off creative cask finishes and other production techniques. The Doublewood variant was clearly meant to be a permanent part of the range, building on the success of their entry-level 12 Year Doublewood. Like its younger sibling, it is composed of whisky matured in ex-bourbon casks that are then dumped into sherry casks for a relatively short period of time. This whisky is bottled at 43% with coloring and chill filtration. Thanks to PDXWhisky for letting me sample it. Nose: balanced malt and dark sherry, green fruit (apples and pears), honey, mildly tannic oak, light wood spices and floral notes. After adding a few drops of water it becomes less sherried, highlighting the malt and wood spices. Taste: honey throughout, sweet malt up front, growing sherry overtones from the middle back, syrupy vanilla in the middle with green fruits and orange peel, light oak and wood spices near the back with only a few prickles of tannins. After dilution it becomes sweeter throughout, more honied and malty than sherried, revealing orange liqueur in the middle and a dank oak-y nutmeg note at the back. Compared to the younger 12 Year Doublewood, this is obviously richer and far more overtly sherried, clearly marking it out as the superior whisky. It can also be contrasted with the 16 Year Triple Cask, which sits in a similar position within its range, the latter having far more aggressive American oak notes and less sherry. I would choose the 17 Year Doublewood over either, but in the scheme of the entire whisky world it's just not a good enough value. Under $100 I think it would clearly beat many of the standard Glens at their game, but at $120+ there are too many other whiskies playing the same game better (Glendronach 18/21, Glenfarclas 17/21, etc). Back in the early-2000s Balvenie helped to establish its whisky geek bonafides by releasing a large number of experiments, ranging from cask finishes to different production methods. Sherry Oak was one of the simpler experiments, which is pretty clear from its name. This whisky was aged in first-fill oloroso sherry casks, then bottled at 43% with chill filtration and maybe a little coloring (though I suspect that it didn't need much, if any). Thanks to PDXWhisky for this sample. Nose: dark, condensed sherry, juicy raisins, a charred edge, somewhat cardboard-y oak, a little nutmeg, vanilla, slightly floral. After adding a few drops of water the malt becomes more clear and has a nice lightly musty character, the sherry is lighter and less dank, a healthy dose of caramel comes out, and the oak is more clearly American. Taste: sherry and malt sweetness up front, quickly turning bittersweet as the sherry becomes dominant, apple and pear overtones with a bit of orange peel around the middle, surprising lack of oak until the very back. After dilution it resolves more clearly, it becomes maltier and less overtly sherried, the citrus in the middle is more clear and the fruit notes expand. I think this sample is starting to give up the ghost. Given that I got the last pour from the end of a bottle that had already been open for goodness knows how long, I can't say I'm surprised. I can see how it might have been better before air and time brought in their wrecking crew, but I have a feeling that the newer 15 Year Single Barrel sherry casks are probably on roughly the same level, with the added benefit of being bottled at a higher strength and still being available. Balvenie's Triple Cask range was created specifically for the travel retail market. Unlike most of their regular lineup malts, it's composed from three different cask types - first-fill ex-bourbon, refill ex-bourbon, and refill sherry - that are blended together rather than the cask finishing of Doublewood or Portwood. After adding this whisky is proofed down to 40% with coloring and chill filtration. Thanks to PDXWhisky for letting me sample this. Nose: a balanced mix of American oak bourbon casks and oloroso sherry, raisins, graham crackers, rich vanilla, light floral notes, honey. After adding a few drops of water the American oak becomes stronger but smoother, some citrus (orange) and nutmeg notes come out, and the sherry is less clear. Taste: malt sweetness backed by mild American oak up front, light sherry influence with dried flowers and berries beginning in the middle, becoming gently tannic at the back, honey undertones throughout. After dilution it becomes sweeter up front, but kind of limp overall, with some corn notes at the back. While on paper this should be my kind of whisky - a respectable age with fully matured casks blended together rather than finishes - the low strength saps some of what makes it good and the fact that it is targeted at the travel retail market tends to suggest that it's meant to have mass appeal, rather than providing any kind of challenge. The most notable difference between this and most other Balvenies is the clear presence of first-fill ex-bourbon casks, which make it more tannic. I suspect that would be even more noticeable if this was at a higher strength, which may be part of why it was bottled at 40%. At the same time what happens after adding water is interesting - the aromas are a little more complex, but less rich, which the flavors more or less fall flat. Overall I think was an interesting idea, but the execution leaves me uninspired. 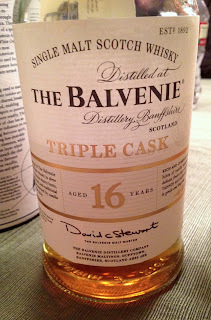 A 16 year old that was primarily refill rather than first-fill casks at 46% would probably be far more appealing to me.